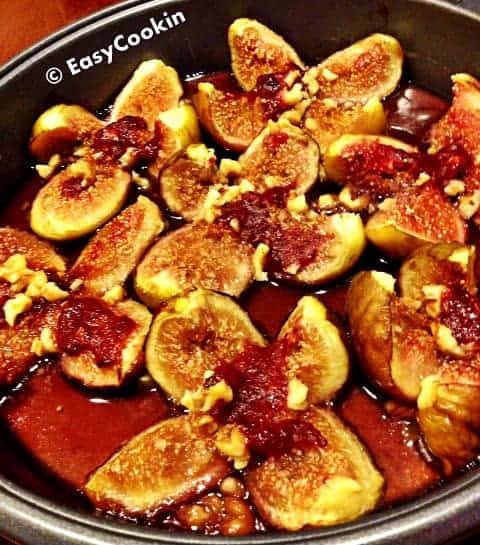 Baked Fresh Figs and Raspberry: delicious and healthy dessert ready in few minutes. Come summer and we are surrounded by colorful, juicy fruits from strawberry, cherry, melons to some not so popular fruits like huckleberry, blackberry, fig and so on. So got my hands on some really fresh organic figs yesterday and baked it with raspberry jam & walnuts…the result was a simple, quick, healthy and scrumptious dessert. So here’s a dessert recipe which is actually heart-healthy, nutritious and equally yummmm !!! ** Since Fig’s are very juicy and sweet hence I’ve not added any sugar. Serving Suggestion: Serve warm with plain vanilla ice-cream or serve as is. In a baking pan, arrange the slitted figs. Sprinkle walnuts and clove powder on each fig’s center. Place little bit of raspberry jam in the fig’s center. Serve warm with ice-cream or serve as it is. No Replies to "Baked Fresh Figs and Raspberry"